Puttanesca is a rich, spicy sauce that is made by combining tomatoes, onions, capers, black olives, anchovies and herbs, and cooking them in olive oil. Heat the oil in a pan, add the onion, garlic, anchovies and chillies and cook gently for 4-5 minutes, or until the onions are golden. Add the tomatoes and capers, and cook for a further 10 minutes, or until the tomatoes are softened and pulpy. Season to taste. 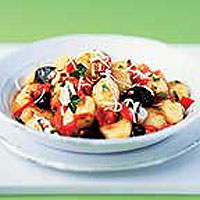 Meanwhile, cook the gnocchi in a large pan of boiling, salted water for 2-3 minutes, or until they rise to the surface. Drain and return to the pan with the tomato sauce, olives and parsley and toss together well. Divide between 4 bowls and serve with Parmigiano-Reggiano. If fresh plum tomatoes are not available, use a can of Waitrose Chopped Italian Tomatoes instead.